“A stitch in time saves nine” is how that old adage goes. That certainly would apply to this mending project. If I had mended the knees of these favourite jeans at the first sign of a tear, instead of continuing to wear them as the erosion spread and spread, it would have been a simple task. Instead it became a ‘project’. Like so many projects, it was started with great enthusiasm. 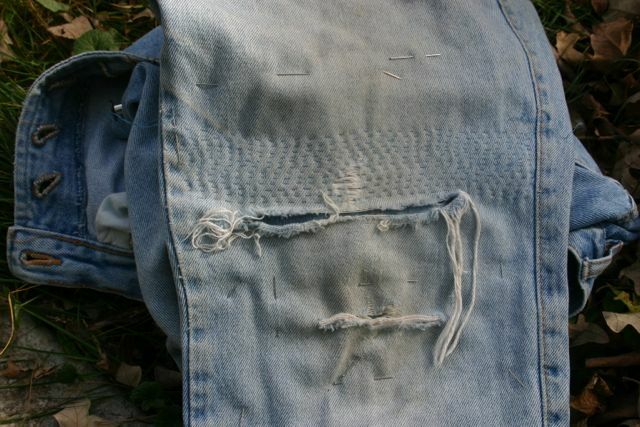 But this visible mending technique of stitching across the surface of the cloth is not intended to be fast and efficient. It is a slow and meditative process. And life being what it seems to be, the basket with the jeans was set down and instantly buried under an avalanche of, well, more projects, and laundry, and stuff. So on this midwinter’s eve, at the turning of the year, I’m picking up this piece of well worn cloth again. Breathe. Stitch. Breathe. Stitch. Slowing the process of decay, while honouring age and imperfection. And maybe, if I sit still, “a stitch in time” will mean stepping out of the whirlwind for a moment. In the dark of this solstice night, time will stop, and then oh so slowly we begin the journey back to the light. Breathe. Stitch. I won’t count the stitches or the moments it takes, but I hope these jeans will see another spring, and that each of these stitches will feel the fresh stain of moist garden earth under the June sun.